Gorgeous tonewoods and versatile electronics. Ibanez proudly introduces the gloss-finish Premium SR2405W, featuring a stunning figured maple body top and an African mahogany body. The figured maple top brings a clear attack, while the African mahogany body delivers a warm and fat low end. The Atlas 5-piece panga panga/purpleheart neck provides tonal clarity and the panga panga fretboard offers a superior note attack. The SR2405W features 18mm string spacing, 1.5mm wider than that of regular SR basses, for a more stable neck grip, and the Premium fret edge treatment permits superior playability. The SR2405W’s neck is constructed with KTS TITANIUM reinforcement rods, increasing its stability and adding sustain. The neck end adjustment allows you to tweak the neck easily, without loosening the strings. The SR2405W boasts Aguilar Super Double pickups, which provide a perfect blend of strong dynamics and rich complex overtones. The combination of the EQ and the Aguilar pickups promises superior tonal possibilities for any playing situation. The Ibanez Custom electronics 3-band EQ is equipped with a 3-way mid-frequency switch for precise tonal control (250 Hz, 450 Hz, and 700 Hz) and a EQ bypass switch for passive-only operation. The MR5S bridge has a wide intonation range and is the ultimate bridge for bass string isolation. Each bridge is independently and securely locked down to the body for maximum string vibration transfer, without interference. The MR5S bridge has adjustable saddles for string spacing adjustments, answering every bassist’s individual string spacing demands, no matter what playing style. The saddles can be adjusted +/-1.5mm. Other features include the BLACK TUSQ XL nut and Gotoh machine heads. Includes gig bag. 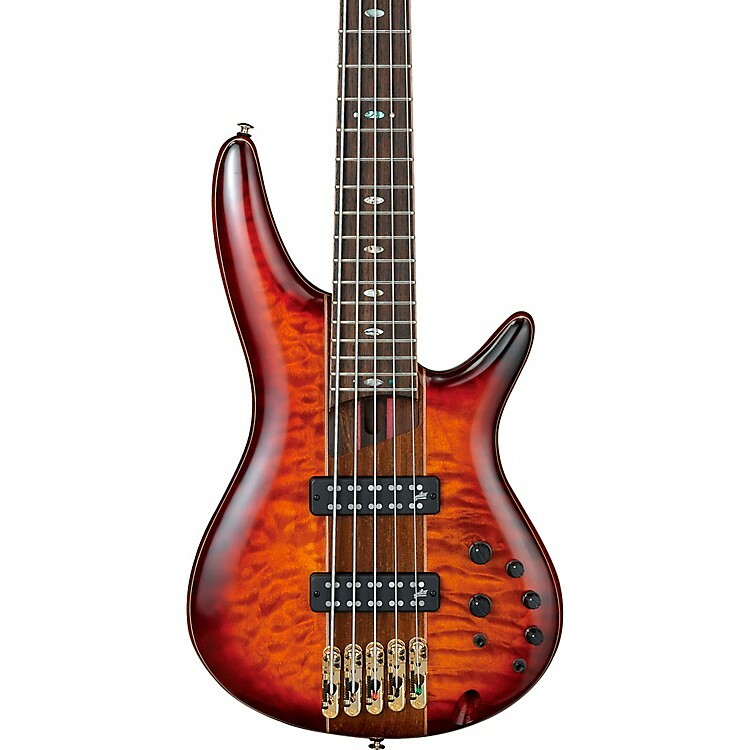 Move up to an Ibanez 5-string. Order today.